Pattern testing is soooooooooo much fun!!! Straight from testing for Kennis at Itch to Stitch, I got selected to test the new women’s pattern by Suzanne Winter at Winter Wear Designs. You can use most knits for this pattern – Jersey, Interlock, Ponte de Roma, slub knits – and can then use cotton woven for the henley placket, sleeve tabs and collar (obviously cut on the bias for this part). Of course you can make the whole shirt in knit and Suzanne recommends cotton lycra for the collar or any knit with at least 50-60% stretch and good recovery is key. The instructions were clear and easy to follow. Never sewn a placket before and now I want to put them on every shirt I make! Based on the draft size chart, my first test version was cut at size 14/16, which was subsequently split up as two separate sizes for the final pattern. 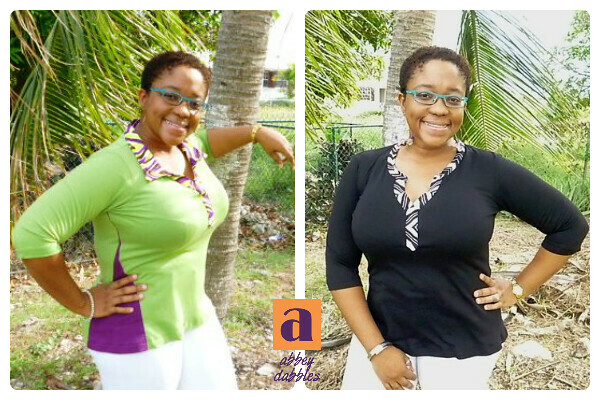 I used this amazing black and white chevron ITY knit from Fabric Mart for the main and purple cotton jersey for the henley collar and placket from local store, Abed’s. Maybe it was just the size, but this was definitely too wide all around for the semi-fitted look that we were supposed to have. the neckline was too low and too wide set for me. The only thing that wasn’t too wide were the sleeves. At 3/4 length, I found they were too close coming down to my elbow and at the hem. The armscye also needed to be raised some as I was getting a dolman style that obviously wasn’t intended by the design. 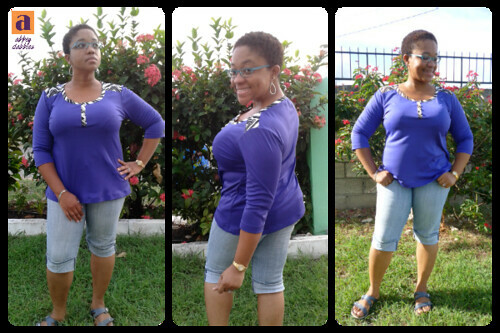 However, the tunic length at 14/16 was perfect for my 5’3″, so I knew I’d be keeping that for #2. 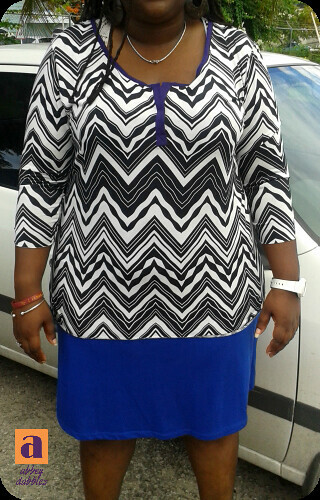 My second and final test was made in size 12 and graded out to 14 hips with 14 tunic hem. I chose this amazing orchid colour interlock knit (have no clue what type it is as I bought it locally and we call fabrics by completely different names than they are known universally it seems) and some scraps from the ITY chevron knit for the collar, placket and some shoulder accents for an amazing combination. 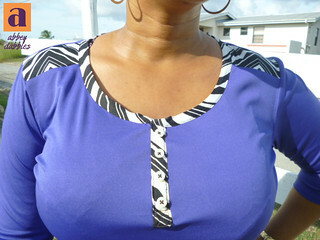 The neckline was raised and also narrowed some in this version of the pattern and I loved these changes. Look how much nicer the collar is laying! And I so didn’t make the placket functioning, can you tell? Lazy sewing at its finest! The only real issue with #2 for me was that I had to grade out to 18 for the sleeves to fit comfortably. 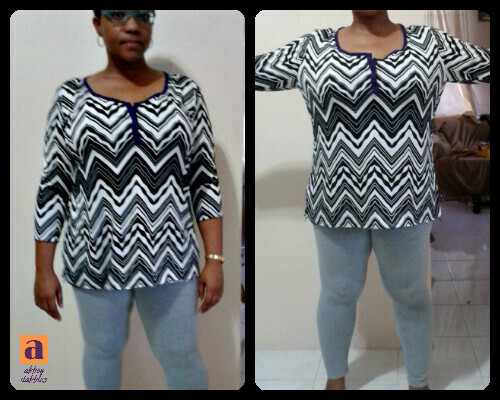 Since most of the testers were noticing the same tightness in the sleeves, regardless of size and even fabric, Suzanne did widen the sleeves for the official pattern. The best part about this pattern for me is the collar options. Just like her Everything But the Kitchen Sink Henley for Kids, Suzanne wanted us ladies to also have a true go to pattern with the Hepburn Henley. You can make this tee with the Henley collar, a Faux Henley placket or No Henley at all to create a regular crew neck or v-neck tee. 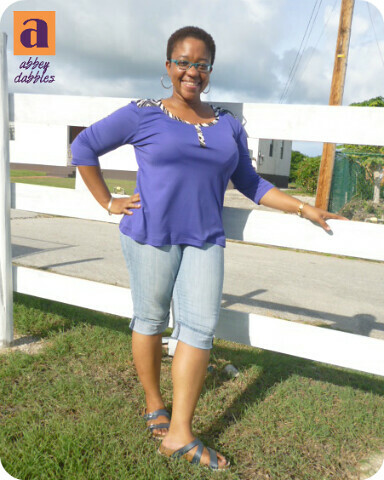 That’s 4 basic shirts styles from one pattern, and when you add in the two neckline styles, the three different sleeve lengths and the two hem lengths, you can get a completely different shirt every time! Pure awesomeness as far as I’m concerned. Can the choir say, #sewallthehenleys! I’m loving this new wardrobe staple and can easily see at least four more of these in my wardrobe. 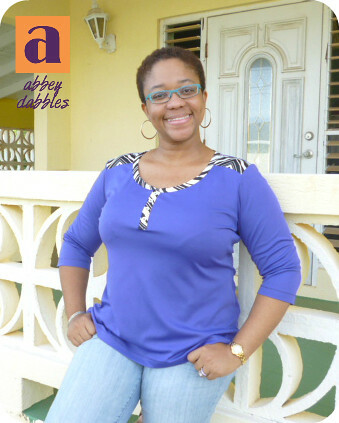 And until the end of today, Sunday, October 11, you can purchase the Hepburn Henley at a special price of US$7.00. 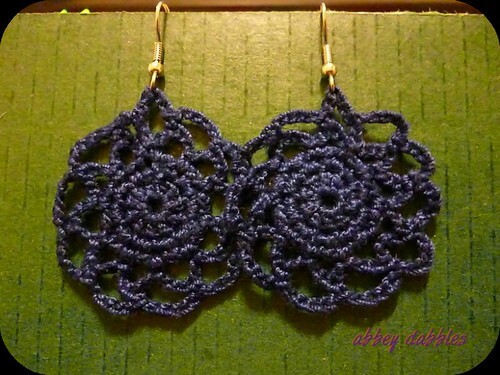 Tibeca, another tester, also did a review of this pattern on her blog; you can check her version here. DISCLAIMER: As a tester of the pattern, I was given a free copy in exchange for my review and commentary. All opinions remain my own. Wow! It’s been exactly one month since we got married! And what better way to restart my blogging mojo than by sharing what I’ve been working so hard on for the past 6 months! Look at my handsome husband! The time and effort required to do a first look is a MUST! Without a doubt, that’s one of the planned details that was absolutely worth it.